A place for hobby welders to learn more about Arc, Mig, and Tig welding. Here you can find different projects, plans,and information. I will have equipment reviews. 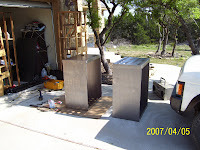 Last year a friend of mine contacted me to build 2 Tool Carts for his precision machine shop. The carts were to hold the CAT 40 tooling for his 4 HAAS CNC Vertical Milling machines. I found through research that a company named HUOT made a cart for this same application. I fashioned my design very similar to theirs, but my final product is less expensive. I started with 16 ga crs material for the carts. I also found heavy 5" iron/rubber casters with 330lbs rating per caster from Harbor Freight. The handle I made from .125 thk 5052-H32 Aluminum. These carts are very stout and will handle all the tools he needs for the machines. 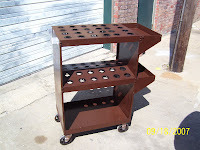 The carts are made from 7 different sheet metal components, top, middle, bottom, sides, end trays, and tray brackets. I assembled them using 1/4-20 thread cadium plated bolts with locking nuts. It took a weekend to get them built and assembled, and another day for paint. I had to install plastic bushings in the tool holes to keep the cart from scratching the tools when holding them. Check out the pics of the carts ( my son helped me out ). Thanks for comming to my blog. See ya. Learn How To Weld Click Here! Custom Chopper Registration Made Easy Click Here! How To Draw Cars Fast and Easy Click Here! 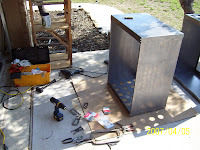 All rights reserved copyright Welding Projects 101, 2011. Powered by Blogger.